For me winter starts when the trees have dropped their leaves and garden flowers are killed by frost. In Vermont this is mid-October, three weeks after the Autumn Equinox. And winter is with us until the earliest spring bulbs emerge and a soft green haze paints the valley. This comes in mid-April, three weeks after the Spring Equinox. Thus our north country winter is a six long month affair. And it lags sun-time, those six months when the days are shorter than the nights, by approximately three weeks. So a necessary condition for living at this northern latitude is to truly enjoy winter in all its vagaries. So many gardeners shun winter. They think of it as a time to be stoically endured, made palatable only by dreaming of spring, while thumbing through the myriad seed catalogs that began arriving even ahead of the winter solstice. Looking out the window, their winter gardens are little more than a wide expanse of snow or, depending on the location and the weather patterns of the particular winter, a brown lawn and some empty flowerbeds. So it is no wonder that, in the gardener’s calendar, winter is relegated to the ‘forgotten season’. But I would like to show you how, with a little planning and forethought, your garden can be as special in winter as it is in summer. All it takes is a little imagination plus a belief in the ‘art of the possible’. I am lucky enough to live where, on many days in January and February, I go snowshoeing through the nearby woods and open spaces. The trees are like living sculptures, their black branches etched in white, making crazy shadows zigzagging across the snow. Out in the open field, the snow is pierced by bleached grasses and fuzzy meadow-sweet; while off in the distance a mountaintop glistens in the afternoon sun. The scenes are like beautiful abstract black-and-white photographs. 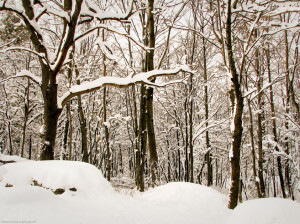 And, as we design our gardens with winter in mind, it helps to take our cues from this natural landscape. 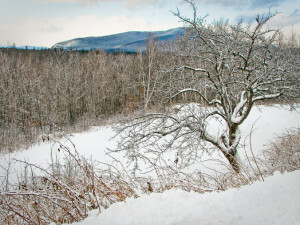 So I invite you take a look at my garden in its winter garb, along with those of some fellow Vermonters, with an eye to making your own garden a place of beauty, even during the ‘forgotten season’. The winter garden is a distant relative of summer’s fullness and busyness. Summer is about color and pretty things, where we are quickly drawn into the details of what we see. We focus our attention on colorful flowers and patterned leaves, and all the while we are busily making a chore list of weeds to pull and grass to mow. But the winter scene is contemplative. It is about abstractions…shapes and textures, browns and blacks with an occasional colorful highlight, against a backdrop of white. And, even at mid-day, the January sun hangs low in the sky. 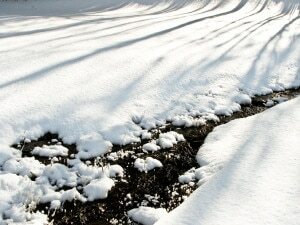 It shines through the leafless trees to paint giant black-and-white stripes on the snow that could camouflage a zebra. Thus shadows too are an essential part of our winter scene. So, to appreciate winter’s beauty, we need a different lens. Without the diversions of summer, you can admire the garden’s composition and form…the ‘bones‘ of the garden. And you quickly embrace its full expanse in a single glance. You are drawn to shapely trees and textured shrubs; twisting vines and bleached grasses; arbors and fences; walls and steps, all set off against an undulating sea of white that is streaked with shadows. These, then, are the elements we use to paint beautiful ‘Pictures in the Snow’ in the winter garden. Winter brings other changes too. As outside temperatures drop, the air gets drier; the views become crystal sharp and sometimes it feels like we can see forever. 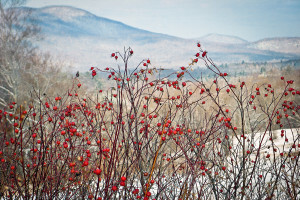 From my garden nearby Mount Moosalamoo (a mere six miles away) seems almost touchable, standing tall behind last year’s rose-hips that grow in the hedgerow behind our perennial bed. And sometimes, as I hurry down the driveway to fetch the morning newspaper, I catch sight of the snow covered mountains of the Adirondack High Peaks, some 60 miles away, bathed in the pinkish glow of a winter sunrise. Thus the wider landscape completes our winter garden picture.